The idea of very young children participating in mathematical thinking may seem strange to some, however, researchers have observed infants at six months of age demonstrating matching skills, sorting and classifying, and recognizing amounts of more and less. These basic math skills exhibit as children work to understand the world around them. Between the ages of one and two, children develop number sense and are able to pick out one or two objects when asked. They develop a sense of shape and space, as they sort objects, stack blocks, and complete simple puzzles. By the middle of their second year, toddlers recognize patterns in the environment like day following night as a continuous cycle. As parents and caregivers, the way we talk to children about mathematical concepts matters. We have the opportunity to promote mathematical experiences through everyday interactions. How can we support mathematical development in children? Play games with mathematical concepts. Matching games with shape sorters and games like memory with six to eight matching cards. Puzzles are wonderful for building shape and spatial recognition skills. Play with patterns with different colored cereal or chunky beads. Sing counting songs and finger plays. Sing songs together like “Five Little Monkeys Jumping on the Bed,” “There Were Ten in the Bed,” and “The Ants go Marching One by One” are fun ways to practice counting skills. Read books that involve counting, repetition, and patterning.Doggies by Sandra Boynton, Goodnight Moon 123by Margaret Wise Brown, 1, 2, 3 to the Zoo by Eric Carle, Fish Eyes: A Book You Can Count On by Lois Elhert are wonderful examples of counting books. Books like, This Is the House That Jack Builtby Simms Tabackor There was an Old Lady Who Swallowed a Flyalso by Simms Tabackprovide examples of repetition and patterning that children are able to recognize while you read. At Stepping Stone School, our skilled teachers practice mathematical skills daily with our children. 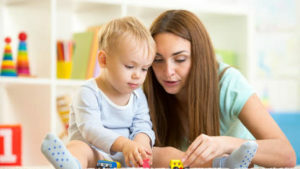 When looking at your child’s learning plans, you will notice activities with special notations like “counting,” “matching,” “one-to-one,” “sorting,” “patterning,” and “shape recognition.” These purpose notations let parents know the skills their child is working on during the activity. Even in our earliest age groups, teachers are working to build a mathematical foundation which will support your child’s cognitive development.